Have you read this post of mine, abut falling in love? Well the other day, after a long stint being away from my love, we were reunited. And that moment, where we had that initial contact, where my lips parted ever so slightly and let myself be consumed by the euphoria, or retrouvailles (pardon my French, literally :D), a colleague of mine was with me. By the way, if you haven’t figured it out, I am talking about coffee. I was off caffeine for like a week, and then on a Friday afternoon decided to get a cup. The first sip, transported me to a totally different state of mind. I am not even exaggerating, my mood instantly got better, I felt my motivation return and I was just happy. But when I told me colleague that she said I was being too dramatic. People just don’t understand our love. It made me think though, is it possible for me to ever find a man who I will love more than coffee. Yes, I know given my life and history, the question really should be is it ever possible for me to find a man, the end. But indulge me okay? The thought popped into my head. Would be hard to find someone that makes me as happy a coffee. That’s probably when I know I am really screwed (or “in love” if you want to call it that) I guess – the day I realise I am willing to re-prioritise or give up coffee for a guy. That’s how I’ll know he is the one. Then again, maybe I just have an addiction to caffeine. I mean after all these years of filling my dark empty heart with the dark liquid elixir, I am bound to have developed a bond with it. Both mentally and physically. Oh well, I don’t know if I’ll ever find a man, but at least I have coffee. Lets talk about help shall we? Both giving an receiving. Though my recent revelation is more about giving help then receiving it. Here’s the thing about me and accepting help. I hate to feel like an imposition. Like I really hate that feeling to an unnatural degree. So when I need something done, I try and explore all avenues of doing it myself before reaching out. The only people I do ask with probably little or no hesitation – my parents. Cause I am a brat and take them for granted. Don’t take that too literally okay? I do try to be a good daughter. Though if you ask them I might not be doing a good job. So here’s the thing about helping people. Lately I have noticed that you try and do a good thing. But somehow it always comes back to bite you in the arse. Whether in a work setting or in your day to day life. I gave one my client’s information that I am not obligated to in any way or form. Not something expected, within my scope or anything. I just thought it will make her life easier. She ended up scolding me, saying I should have given that information earlier. I don’t know why I bother sometimes, and with some people. A lot of the times I just ended up feel unappreciated and stupid, and wondering why I bothered in the first place. But I will continue on in with doing what I do. I have faith that whether unappreciated or stupid, they will have a positive impact in some tiny shape or form. No one wants my bagels. No not a euphemism. Though, even if it was, well, no one wants my bagels. That’s how my life goes. Literally or metaphorically, no takers. I made yummy blueberry bagel, which I think I’ll be sick of by the end of the week. I get all excited cooking or baking, but afterwards when I have no one to share it with my happiness is short-lived. So I post pictures on social media for some superficial sharing. So yes, I haven’t blogged in a month. Nope life hasn’t gotten more exciting, I am just losing my motivation, as I have mentioned before. It’s funny it’s like the less outlets/people I have to share stuff with, the more I retreat into my head. I don’t think that’s very healthy but oh well, what to do? Another thing I was thinking about today after a recent conversation, men. Why do they like to lie, cheat or disappear in an attempt to spare your feelings when it comes to bad situations? For example like why disappear on someone when you decide you don’t want to pursue a relationship with them? Are men these days really that cowardly or just plain stupid? I don’t get it. By the way anyone know any sites I might be able to find affordable swimwear fit for fat people, i.e. me (UK size 16-18)? I need new ones and I found one I really like on Torrid but I can’t afford it. I spent today watching The People versus OJ Simpson. Yes I watched all 10 episodes. And yes in 1 day. Judge me if you must. I don’t really care. It’s been a quiet lonely weekend. Very lonely. Back to the series. I love John Travolta, but does anyone else think he’s starting to look more and more like the villian from “The Mask”? I read this article too. I guess it doesn’t say much that is new or shocking, but it’s worth a read. I spent just over a week navigating and travelling Japan alone. You know all the articles (like this one) about how solo travel is empowering or life changing? Yeah….No. I didn’t get any of that. Maybe cause I am older (most of the article authors sound really young), or used to being on my own, or that I didn’t backpack across rural Asia/Africa. I didn’t feel any of that crap. I just felt like I was travelling. Maybe I am anti-social by nature, but unlike in the aforementioned articles, I didn’t make new friends either. In fact I didn’t really seen many solo travellers and the few I met weren’t very friendly. I even had a mini melt-down one night when I reality kind of slapped in my face. It dawned on me that this is how my life is going to be, eating, sleeping, getting lost by myself. No one to share my experiences with. Just me. Though I always knew/know that, it just felt extremely sobering. But that was just 1 part of 1 night. Barring that it was actually pretty nice to be travelling on my own. No one to answer to. Own time, own target. If I wanted to sleep in I could, if I wanted to wake up early I could. I could have lunch at 3pm and just a matcha latte for dinner (yes I actually did that). It was good. It was a little daunting on the first day, especially since I didn’t speak the language but I managed. At the end of the day, did it feel lonely travelling alone with no one to talk to? Yes, incredibly at times. Would I do it again? I’d leave tonight if I could. When you’re entering your 30s as a fatty but trying to stay healthy by working out consistently, one thing becomes clear – Pushing yourself when exercising, whether or not it makes you fitter or healthier or happier, it gives you the ability to pull muscles you never knew you could. And usually by doing the simplest of things. FML. I got burnt today. I was getting a wax and it was too hot. I told the beauty therapist, I got burnt anyway. And to top it off, she was being extra thorough so she went over and over again the spot. As I was getting my skin burnt and ripped off, I was wondering, why do I even bother? My face okay, people have to look at it. But the other hair removal, who’s going to notice? What is the bloody point? Maybe I’ll do it with lesser frequency. It will save me some money. 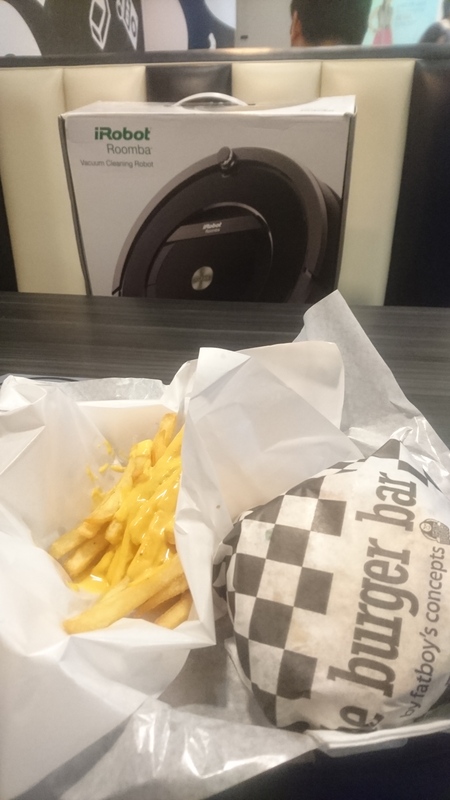 Oh and if my life isn’t lonely enough, I had lunch with a vacuum today. Me and my vacuum. I didn’t do it on purpose, if you were wondering. I just happened to plonk it there before ordering my lunch. My mental health has not deteriorated to that point. Yet. It’s getting there. On Friday, there was an incident at work, a bad one that affected the entire company and operations. It was bad. So I went into my coping mode. To everyone that walked pass my desk or made small talk with me, I said stuff like “what a wonderful Friday”, “what a brilliant day”. This is from someone that rarely talks to anyone might I add. And then I started getting comments like, it’s great to have someone so positive, or you have a very good attitude. It’s called sarcasm you dumbasses. No I am not happy or looking at things optimistically. I don’t know if it’s because of the Chinese speaking culture there things are lost in translation. But jeez. I want to say it’s like working with Chimps, but I think working with Chimps would probably be more fun. There’s this dress right, I have been walking past it for weeks. It’s a simple black dress with small scattered hearts printed. Very simple, I figured I could pull it off, it was just a matter of me affording it. So today, as I passed it, I thought, I’m going to get it. I tried it on. Simple dress in a flattering cut and it didn’t look right. Sighs. I am so jealous of those girls that can just buy stuff without trying it on. Or those that can shop in most stores and not worry about whether they carry stuff up to your size. Fat girl problems. What you going to do. So hard to find a pair of tights that fit comfortably. Cause you know, fat people don’t need to exercise. So after a crappy couple of weeks, I woke up this morning with a giant red zit on my face. That’s why Rudolph is a little shaken these days. Cause he has competition. Seriously who said skin/acne gets better after your teens? I never had problems then but life is making up for it now. Because looks wise I have everything else going for me, right? My life has hit the stagnant point once again. Work wise things are actually not too bad. Except my back-up/buddy at work. She’s become extra weird. 1 minute she’s being all chummy, the next she gives me a cold shoulder. She says the weirdest things and is a huge busybody. She also “remembers” things wrong and spreads them around to other people. Like seriously, the other day she casually mentioned (about organising a team lunch) that we better not pick a Chinese restaurant cause it will be difficult for me being halal on all. I didn’t bother correcting her that I am not Muslim. Or to reinforce my love for bacon and wine to her. A love so pure doesn’t require any explanation. I so wish I had a glass (read: bottle) of wine now. Anyway, I was always prepared for this year to be a little lonelier with my sister and cousin out of the country. And as time goes on, I do get more used to it. But those loneliness pangs, when they do come around seem to get stronger. I am still trying to work on those. When I get those pangs, my attention sometimes turns to dating apps. I think maybe this time the pool of people on it will be different. But thankfully my brain quashes that thought immediately. I heard about an app for you to make friends, just friends. Decided to try that out and guess what, not enough people on that app here. I am on a tiny tropical island with just under 6 million people. Where all the lonely people at?